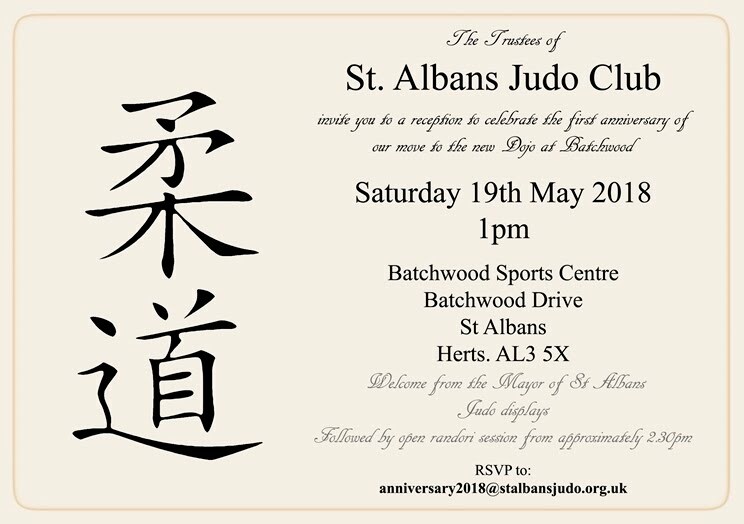 On Saturday 19th May 2018 St Albans Judo Club will be celebrating the first anniversary of its move to the new dojo at Batchwood. To mark this occasion the club will be hosting a reception at the dojo to thank the many people who have helped and supported the club throughout its history, and especially in the acquisition of the new premises at Batchwood. The event will run from approximately 1.00pm to 2.30pm. The Right Worshipful the Mayor of St Albans City and District will open proceedings. There will be a buffet and some demonstrations of Judo. Following the main event there will be an open randori session for those who wish to participate, or just watch. If you wish to participate in the randori, please ensure that you bring your licence with you.